UK STEM businesses have warned of a growing skills shortage as they struggle to recruit qualified workers in science, technology, engineering and mathematical fields. According to new findings from STEM Learning, the largest provider of STEM education and careers support in the UK, the shortage is costing businesses £1.5 billion a year in recruitment, temporary staffing, inflated salaries and additional training costs. The STEM Skills Indicator1 reveals that nine in 10 (89%) STEM businesses have found it difficult to hire staff with the required skills in the last 12 months, leading to a current shortfall of over 173,000 workers – an average of 10 unfilled roles per business. This shortfall is particularly acute for women entering STEM careers where less than 20% of the workforce are women. The number of graduates is a result of many years of education and the earlier that we can get young people interested in STEM the better that the results will be. We can’t expect schools to be the sole instigators of that change either, as an industry we need to step up and help to provide life change STEM opportunities to children and young people. That’s one of the reasons why I was delighted to be a mentor as #ChorleyHack which was organised by the town council in the area where my office is. The levels of preparation and enthusiasm were an inspiration, the room was buzzing. The children and young people were so focused on the task that many of them returned early from their lunch to get their code as far along as possible, even though the task was not to get their code finished. The sophistication of their work was amazing with a significant depth of understanding of the challenge subject area. As mentors the conversations where inspiring, I particularly enjoyed an extended chat with one of the children who was very excited to explain to me how Scratch worked and about another project he was writing in Python. That’s right, a significant proportion of girls, something that was evident across the day, no 20% here. #ChorleyHack was a wonderful opportunity to demonstrate that girls can indeed code and another nail in the coffin of the lie that IT is just for boys. Thanks go to each of the teams leaders, mostly teachers, who had clearly invested a huge amount of time in getting the children and young people prepared for the event. A particular thanks goes to Simon Charnock, Digital Transformation Officer, Chorley Council who did a fabulous job of facilitating the whole event. If we can see this level of enthusiasm and passion continuing through the education system then we should be looking forward to a very bright future. How do you bring significant change to an organisation? Particularly a large, multi-national organisation? Where do you start once you’ve decided what it is that you want to change? How do you make change that is sustainable? This is no ordinary organisation either, this is Microsoft, an organisation that has some huge fans, but also massive detractors. It’s an organisation that has made some very public missteps and become regarded as arrogant, but is also one of the most valuable organisations in the world. How do you revive a giant? While it’s a cartoon, it has meaning because it is based in a truth. Moving away from this situation required a significant change of culture and to use Satya’s words for Microsoft to find its soul. 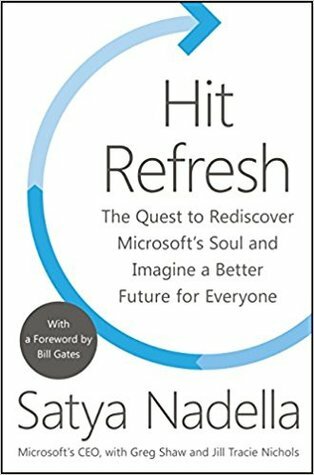 This book is partly an autobiographical telling of how Nadella got to be Microsoft CEO, it’s partly an outline vision for the future of Microsoft and partly a discussion on some of the opportunities and challenges currently facing the wider technology industry. I found the autobiographical parts the most interesting, but I like biography. These sections give some insights into how someone born in Hyderabad becomes the CEO of an organisation that has had a dramatic impact on the world that we know. There are part of these sections that are very personal, particularly when he is talking about his son Zain who suffered in-utero asphyxiation during his birth which caused severe brain damage and left him with cerebral palsy. This isn’t one of those management books where someone tells you how brilliant they, there’s more humility than that. Nadella describes the role of CEO as “curator of culture” and it’s clearly culture that he regards as the primary change required. Speaking as someone who works in the technology industry, Microsoft is an organisation that divides opinion, and it takes people a long time to change an opinion. Nadella took over as Microsoft CEO in 2014, since then Microsoft has sought to show a very different culture, embracing many things that previously would have been regarded as red-lines. Two words that Nadella uses several times in the book are listen and empathy neither of them words you would have associated with the Microsoft of the Steve Ballmer era. The CEO is the curator of an organization’s culture. Anything is possible for a company when its culture is about listening, learning, and harnessing individual passions and talents to the company’s mission. Creating that kind of culture is my chief job as CEO. The culture change I wanted was centered on exercising a growth mind-set every day in three distinct ways. First, at the core of our business must be the curiosity and desire to meet a customer’s unarticulated and unmet needs with great technology. This was not abstract: We all get to practice each day. When we talk to customers, we need to listen. We need to be insatiable in our desire to learn from the outside and bring that learning into Microsoft. Still, many responses to the recently announced purchase of GitHub reflected suspicions of the arrogant Microsoft. I suppose it just goes to show that 4 years isn’t a very long time in people’s memories. The third section, on some of the opportunities and challenges facing the technology sector are also interesting, but for a different reason. These sections aren’t as insightful into Nadella’s thinking on a particular subject, but feel more like the thinking of the broader Microsoft organisation. There wasn’t, for me, any particular revelation here. Summarising: Nadella is an interesting character with an interesting background. He seems to me to be taking Microsoft in the right direction, but it will be interesting to see where he gets put when the history of the current age is written.